The Dilapidated Marco Luethy Weblog - Weblog > Sarcastic Fantastic! 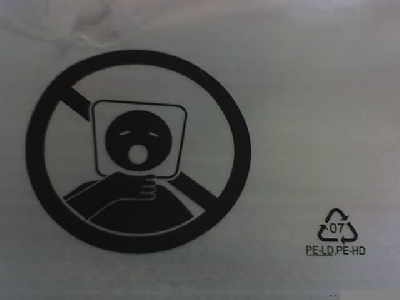 This was on the bag in which a new laptop from Dell was packaged and shipped to us at work. Friday. The twenty-second of September. Year 2006. The morning hours. Still sleepy. Just woke up. Desire to return to my bed. A persistent desire. Here’s another entry with the same boring crap as all the rest. (You must login to gain access to this content.) Money. Money. Money. It’s kind of sad. I don’t really have anything to do with the stuff, yet I still manages to vanish. Though I must admit, I do have a nice stock-pile growing for future travels. I think I have enough to spend a month in Greece in the off-season’s right now (based on previous experiences.) Although, I’ve already been to Greece. Where should I go? I want to visit the far-eastern bits of Russia. The parts you never hear anything about, or really know anything about.. but always look entrancing and mysterious on the map. The parts north of Korea. Rabble Rabble Rabble. I’m rambling. 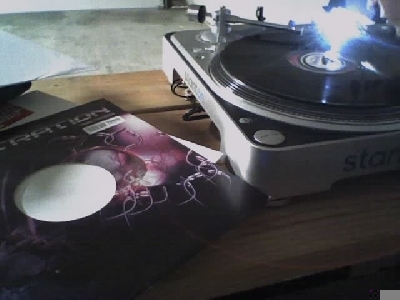 I bought more vinyl on Wednesday. It wont be here until Monday. That’s too long to wait. Waaaa. I’m still rambling. I feel hyper yet tired and unmotivated. What a lovely dovely handy dandy combination! I worked on yet another mix-set on Wednesday. High quality variable bit-rate MP3 of take one can be downloaded here (121 MB). Also, for those in the know, here’s a CUE file. Additionally, here is the track-list. The levels are a bit screwed up because I kept forgetting about them, and some of the transitions are in need of some work. But that’s okay, it’s only the first take and not the final version. Kind of like a release candidate. I’m sure that really doesn’t clarify anything to most readers. Oh well. Rabble rabble rabble. It’s been one of those weeks where everything has been long, dull and boring. Monday was long and boring and didn’t end soon enough. School on Tuesday sucked for no other reason than it being school and I didn’t want to be there. I got my geography test back from the Thursday the week before. I missed one question out of 100. I’m such a failure. I spent hours and hours and hours studying, too. Sarcasm. Wednesday was meh. Thursday came along and I entirely winged an in-class essay for my world history class. Post entirely boring English class which Matt and I left early because we didn’t see a point in staying to go take yet another tour of the new library’s resource centre the weeks started looking better. But not really. Went to a thrift store with Matt and Sarah and then met up with Mallory at the thrift store in Oxnard. We returned to Camarillo and ate at Daphnes then went over to visit some friends of Mallory and Sarah’s. Soon, I returned home and Matt showed up to mix a little. That was my Thursday. Woo hoo lee doo. Rabble rabble rabble. (You must login to gain access to this content.) Laa dee daa. Yea.. I’ve got absolutely nothing to say it’s fantastic. Heh.. Now as I continue writing this fantastic entry, it is already 16:40. An hour and 40 minutes ago I returned from lunch with Grant and Matt at Steak & Hoagies on Arneil and a visit to Fry’s to check out some of the small digital cameras. I’m probably going to go to Fry’s after work to buy a Canon SD600. Spend money spend money. Tra la la. Spendie spendie. Consumerism tra de da. This whole entry is so retarded I love it-but not really. The best part is, if you’re reading this, you’re still reading this and that’s funny in itself.